When it comes to lunch or snacks, sometimes you just need something quick. Sure, it would be great to fix yourself a nice steaming plate of lasagna for lunch. Of course it would be fabulous if you had the time and the energy to create homemade Bagel Bites when snack time rolls around. But who am I kidding? If you’re reading Small Kitchen College, I’d say you’re probably pressed for time more often than not. And when you don’t really have that time to linger over a pot of stew or spend hours crimping the edges of mini hand pies, you need something that is just as filling, just as tasty, and, quite probably, infinitely healthier. 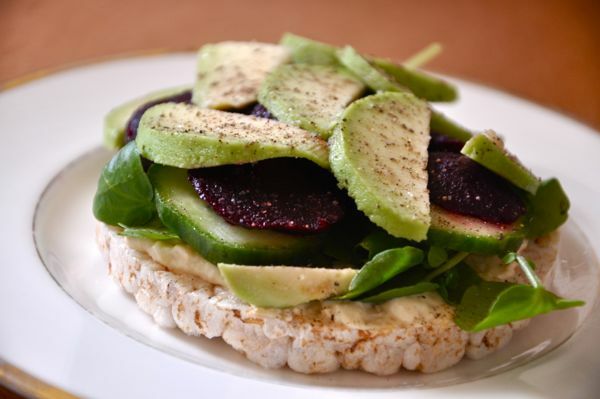 With filling whole grains from the brown rice, protein from the avocado and hummus, and a hearty does of vitamins from the other veggies, you are set with a well-rounded snack or light lunch. Two of these usually fill me up, but I promise you won’t even feel guilty if you eat a few more. This is more of a template than a recipe. You can play around with the vegetables and the combinations, if you like, adding more or less of one ingredient, swapping guacamole for hummus, or really whatever strikes your fancy. That is the great thing about these little tartines. They are infinitely variable and, as long as you choose good ingredients, always delicious. Spread hummus onto rice cakes. Divide watercress between rice cakes. Layer cucumber, beets, and avocado over watercress. Finish with salt and pepper. This is genius!! Haha seriously…thank you for the great idea!